You have most likely experienced some form of numbness in one or both legs at one time or another. Perhaps you have stood up after a prolonged period of sitting or the sensation has suddenly covered your entire leg. Leg numbness may not be a life-threatening symptom or condition, but it can be associated with serious health issues. The leg numbness and tingling may radiate to spread into the feet as well. Learn accompanying symptoms and possible home treatment for numbness in feet and leg issues. What Are the Causes of Leg Numbness? The sensation of tingling or numbness in one leg, or both, results from a compression of the blood flow or to a nerve. This damage can be caused by inflammation, trauma, disease, or infection. The numbness can dissipate quickly or be felt for a prolonged period of time, depending on the underlying cause. Numbness can be referred to as paresthesia when there is no apparent reason for it. With this condition, tingling, prickling, or a burning sensation is also a possibility. With some causes, there may be other symptoms in addition to numbness. You may experience leg numbness with compression on nerves after continued sitting or standing, or nerve damage from health conditions such as multiple sclerosis. It can also be caused by a blood flow interruption due to circulatory conditions such as deep vein thrombosis, Buerger’s disease, arteriovenous malformation, frostbite, or peripheral artery disease. Orthopedic conditions can affect the leg with numbness from osteoporosis, a back injury, herniated disk, fracture or bone break, degenerative disk disease, and nerve entrapment. 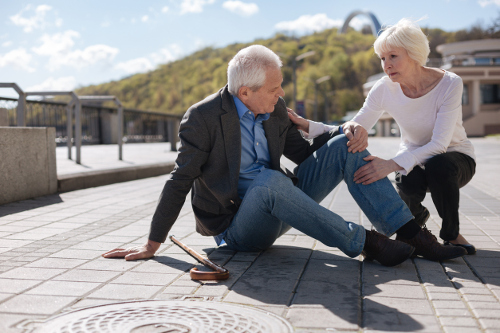 Leg numbness can also be a symptom of a neurological disease known as alcohol leg, hypothyroidism, diabetic neuropathy, lead poisoning, or systemic lupus. It can also be caused by or indicate a possible stroke or tumor. Furthermore, the nerves may be affected by a deficiency in vitamin B12 and inflammation within the spinal cord. The numbness felt in your leg may be a symptom alone, or accompanied by other sensations and symptoms. This is evident with a back injury caused by a compressed nerve as the leg numbness may elicit an adjunctive pain in the back and legs. Leg numbness is a common symptom among patients with fibromyalgia, a muscle and soft tissue disorder. The numbness is a mild factor in comparison to the symptoms of chronic pain, fatigue, insomnia, mood instability, and memory problems. The constant numbness is not to be taken lightly as it can be a discomfort for a large percentage of patients. The numbness and other paresthesia effects such as tingling may be experienced with fibromyalgia as a result of the muscles compressing on the nerves during episodes of either muscle stiffness or spasms. The muscle spasms of fibromyalgia are referred to as cold-induced vasospasm. Here, the blood vessels narrow or close during an involuntary spasm, blocking blood flow and causing the numbness sensation in the legs and other parts of the body. This sensation usually appears suddenly and can reoccur at any time without warning. If your numbness of legs is not caused by a serious health condition for which you require treatment, there are some great home remedies that you may want to consider incorporating into your lifestyle today. Apply a hot compress or hot water bottle on the area where you feel the numbness sensation. The heat can help relax the muscles compressing on the nerves and help open any narrowed blood vessels. Ensure you are consuming sufficient amounts of vitamin B12, calcium, sodium, and potassium. Unbalanced levels of these essential nutrients can cause numbness in legs as your metabolic and central nervous systems can be affected. A proper massage of the affected area can relieve numbness and other symptoms. It should be done by a trained masseuse to target the correct muscles and stimulate the nerves. Using essential oils alone or in combination with massage therapy can release tension, both physical and emotional, that can attribute to numbness in legs. Rosemary oil, lavender oil, primrose oil, and olive oil can be used as a 20- to 30-minute treatment to alleviate numbness. Because it could help to increase the muscle’s strength, coconut oil is in a category of its own. Heat the coconut oil and apply directly on the legs, massaging in a circular motion. A home remedy used for generations to treat numbness of extremities, mustard oil may also resolve your leg numbness sensations. Warm the mustard oil before applying on leg. Numbness in thigh or leg discomfort can be caused by poor blood circulation, especially after sitting with crossed legs or sitting on the side of your leg. Elevate your leg to promote proper circulation. Place it in an upward position or prop it with a pillow for several minutes. Performing yoga stretches and positions on a daily basis can promote good blood circulation to prevent numbness of legs. It can also be done for immediate relief of numbness. Just as yoga offers circulation benefits, doing at least 30 minutes of exercise on a daily basis can also help. This can be walking, running, jogging, or swimming activities. With some cases of numbness caused by blood vessels dysfunction, use of herbs such as Gingko biloba may be helpful. Medicinal herbs have been known to help with improving blood circulation and treat circulatory disorders. Lifestyle changes can be overwhelming and should be approached slowly and steadily. Other activities to help with treating and preventing numbness include staying hydrated, maintaining a healthy weight, using of proper footwear, keeping warm when exposed to cold temperatures, and avoiding smoking. In addition to changing daily lifestyle habits and adding essential nutrients, you may also want to try some foods that could prevent bouts of numbness. Take one tablespoon of Indian gooseberry powder, and mix it with one glass of milk or water for a daily morning beverage. Incorporate one avocado in your daily diet to promote good blood circulation with the magnesium component. Add soybeans to your dinner dishes to prevent numbness by strengthening the muscles. Combine cayenne, ginger, garlic, and water to create a broth. Enjoy three times each week. Increase blood flow by drinking a glass of milk and honey with one teaspoon of turmeric. Drink one glass each day. In a glass of warm milk, add one tablespoon of cinnamon for a daily drink. Eat foods enriched in vitamin B6 and B12 such as eggs, dried fruits, milk, fortified cereals, bananas, cheese, fish, oatmeal, yogurt, nuts, and seeds. Promote blood circulation and proper functioning of the central nervous system with magnesium enriched foods. These include seeds, nuts, peanut butter, low-fat yogurt, dark green vegetables, and dark chocolate. Yes, I said chocolate. Leg numbness is a real discomfort for many people and is usually brought on by health conditions or trauma to the blood vessels and nerves. In most cases, it is not life-threatening but can be associated with painful disorders such as fibromyalgia. It can be a condition in itself or a symptom accompanied by other sensations and pain. Mild conditions of leg numbness could potentially be treated with home remedies and by making several lifestyle changes. Since much of the numbness can be caused by poor circulation, you may be able to prevent numbness in leg sensations by incorporating key foods into your daily diet. “Home Remedies for Numbness in Hands and Feet”, Top 10 Home Remedies; http://www.top10homeremedies.com/home-remedies/home-remedies-numbness-hands-feet.html, last accessed June 2, 2017. “24 Home Remedies to Get Rid Of Numbness in Hand and Feet,” Home Remedy Hacks, January 5, 2016; http://www.homeremedyhacks.com/24-home-remedies-to-get-rid-of-numbness-in-hand-and-feet/, last accessed June 2, 2017.